In my previous article I discussed how the Hansa Center is "Forging ahead into the new frontier of healthcare – Restorative Care." Many of you expressed interest in hearing why "Restorative Care," as practiced at the Hansa Center for Optimum Health, is so powerful. Our success is not from one thing we do, but is from the many combinations of things we can bring to bear on your case. New technology has been developed that enables the brain to “defrag” or “reboot” itself, and another technology has been developed that can tap into the communication systems of the body to help guide the doctor prioritize what else is wrong in body and mind, and what needs to be done to help the body correct them. The brain is the computer that controls your body chemistry, and every system in your body. It should make sense that chasing the symptoms with drugs is pointless when the real issue is a software problem. When our doctors address not just the issues in the body, but also the brain, in a maximally applied effort to restore the integrity and function of every tissue, gland, organ, and system in the body, the overall effect is often enough to completely eliminate many biochemical imbalances, enable the body to release or resolve pain, to shrug off the cellular memory of emotional, mental, and physical trauma. The Hansa treatments are thoughtfully and strategically orchestrated by the doctors during one hour sessions every day, Monday through Friday for two to three weeks. If you ever wished your doctor would act like you were the only patient he had to work on and that your doctor would be knowledgable about every part of the body, and that your doctor would keep digging everyday to find deeper and deeper issues through testing, the doctors of the Hansa Center are just that. Many people always feel a little better at the start of almost every type of treatment only to regress after a while. The first 2-3 week visit can create remarkable results all by themselves, however it must be understood that even a blister can take three to six weeks for the skin to completely heal, and that is saying you didn't keep aggravating the blister or it didn't get infected, both of which would add even more to the healing. How much longer when your body's issues are much more problematic than a simple blister? The most remarkable technology unique to the Hansa Center is BioResonanceScanning™, an adjunctive technology that enables the doctor to determine what new software then body needs to undo your lifetime of cumulative problems. This entails all of the problems physical tissues, the things interfering with proper metabolism, which is all the biochemical reactions in the body, including interferences from deficiencies, toxicities, microbial issues, not to mention correcting the the flow of bienergetic information, all the environmental interferences, and all of the epigenetic issues. NeuroPhotonic Therapy is another healing innovation that uses the guidance of BRS to help the body open up the biophotonic communication so that information can flow at the speed of light throughout the body. NeuroCardial Synchronization is a new technology that uses High-Definition Acoustic (Audio) recordings of the heart sounds that are subsequently played through headphones into the brain. Again BRS is used to detect dysharmonics between the heart and brain with real-time testing and support treatments. The heart and the brain are the dual processors of the body. Recent research has verified that up to 65% of the neurons in the heart are identical to brain neurons. The heart is a brain in its own right. These two organs are now understood to be corrupted in Lyme disease and every other illness. Synchronizing the heart and brain can correct many of the issues affecting the heart, brain, and body. In summary, it really is like rebooting and defragging the body's dual processor computer...the brain and the heart, and then problem solving the remaining issues in the rest of the body. Obviously to take it to an extreme, if you have a thirty foot tapeworm in your intestines, all of this defragging, rebooting, synchronizing, and such will not eliminate the worm. The worm and every other issue and damaged tissue must be addressed in such a way as to not upset your freshly restored bio-computer. On top of these advancements, and all of our innovations developed over the last 20 years of helping only the toughest cases, from literally all over the world, we have recently added the following huge advancements in the past year. Not only did we get the best electronically-controlled, zero-gravity chairs to increase the comfort of all of our therapies, we also recently brought on four PEMF (Pulsed Electromagnetic Field Therapy) BEMER mats on zero-gravity chairs to increase blood micro-circulation, which not only is accumulating more and more testimonials of dramatic relief of circulatory problems, but also with neuropathy, and the reduction of pain. Improving micro-circulation is vital to the delivery of nutrients to the tissues that are so deprived from the poor delivery of even the best remedies and medications. 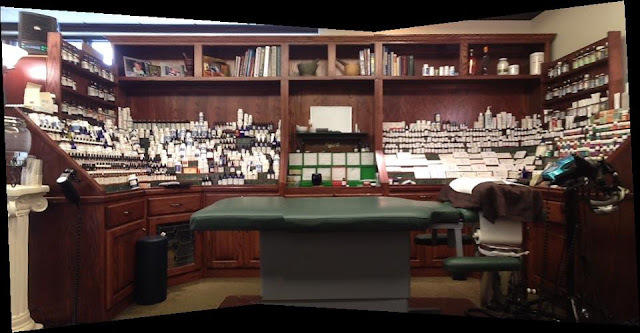 We built three state-of-the-art therapeutic massage rooms with Solfeggio resonances, Biomats, targeted homeopathic ointments and oils, and custom painted copper impregnated ceilings to help create the warming, healing frequencies in the room. Often overlooked, caregivers of those who are sick are often just barely holding on to their sanity. To help not just the one who is sick, but the one who is working 24/7 to take care of them, we are offering free "Taking care of the Caregiver group support sessions" twice a week. We have five doctors and 22 staff to do everything we can to create the ultimate healing experience. We have posted signs around the clinic and therapy rooms that "This is a no negative conversation zone..." To protect everyone under our care from having to deal with someone's negativity as they are striving to maintain a healing outlook. Every effort has been made to shield patients and staff from harmful electromagnetic pollution. We added EMF blocking paint in all equipment rooms, EMF blocking devices all over the clinic to shield you from stray electromagnetic pollution from computers and electrical wiring. We have eliminated most of our wifi computer networking and hard wired almost all of our commuters to eliminate as much wifi interference to the healing process as possible. We custom built our clinic software so that from the time you book your first appointment to the day you leave the clinic, the coordinating of your treatments, therapies, and accounting is as seamless as we can make it. We have recorded lunch lectures from each of our fabulous doctors. These are posted on our Hansa Center YouTube channel, so that you can increase your knowledge of what we do and why we believe it is all important to your healing. We have improved our newsletters and blog to give you more scientific references to the concepts we are using and writing about on Facebook and on Dr. Jernigan's blog www.DavidJernigan.blogspot.com. Increasing the peer-reviewed references gives you more knowledge and confidence in sharing our articles with your friends and family. We have greatly expanded our arsenal of natural botanical, nutraceutical, homeopathic remedies in our ongoing quest to always have the best remedies in each treatment room to help facilitate achieving the most optimum structure and function that we can for your body. We brought in five Sulis Master Remedy makers that bring the potential for many thousands more types of homeo-energetic remedies and homeo-energetic, autogenous immunotherapy to create powerful healing remedies from your own body fluids. We also brought in two of the advanced model of the Halo system for using powerful UV light to deliver remedies in situations where the person cannot process remedies through the digestive system. To deal with sublingual meridian and scar tissue meridian interferences, pain syndromes, and deal with neuropathic issues we brought in the two probe Dolphin NeuroStim device. Alcohol intolerance, enhancing your body's production of the necessary enzymes to properly metabolize alcohol and repair deficiencies of Aldehyde Dehydrogenase, and Alcohol Dehydrogenase. Histamine intolerance, assessing all the enzymes in the histamine metabolic pathway that leads to the histamine toxicity, which is often confused with many diseases. Ways to detect and address empathic symptom susceptibility, where a person experiences the physical, emotional, and mental symptoms emitted passively by other people around them. Interleukin beta-1 metabolic pathway testing to specifically address runaway inflammation. Hemoglobin metabolic pathway testing through the production of heme, porphrins, all the way to Cytochrome A, Cytochrome P450, and other highly important substances in the body's detox pathways. New testing for bacterial urease enzymes that lead to the accumulation of ammonia in the brain and body. And so many more treatments that are too numerous to do justice here. The healing of future is bringing the maximum applied effort, and the best healing tools to do everything we can to restore every single issue in the human body. From this condition, what is called disease often falls away, as health replaces illness. We recently also brought on Broad-spectrum infrared saunas, that combine Acoustic Resonance Therapy and Chromo-therapy all at the same time. We took on blood work software-assisted lab work interpretation that helps our doctors determine many associations and issues that most doctors miss, leading previous doctors to tell you nothing is wrong with you. Many people still think antibiotics are the only way to go. I'm not saying you can't beat LD using antibiotics however why destroy your body trying to kill every last bug? When health is restored, Lyme bacteria and confections just become one of the many microbes that live in the health human body without causing disease. We virtually don't care what diagnosis a person has been given, because our focus is on winning through empowering the body to dominate any issue. We are not treating diseases, we are changing lives from the inside out and the outside in. The only way to address all the myriad of issues that are definitely going on in every system of the body is to have thousands of remedies, superior training and healing technologies, and not just a canned protocol. Every effort should be employed to ensure that every treatment and therapy works synergistically to restore the body's ability to function at its highest level of coherence and thereby the body. The Hansa Center for Optimum Health spends millions of dollars every year to ensure our healthcare center will have the best facilities, the best remedies and supplements, the best healing tools, therapies, and the best staff, and the most state-of-the-science systems to achieve the maximum healing of you body.